ADATA has introduced its new entry-level SSD for client PCs. The Ultimate SU630 is the first drive from an independent maker of SSDs based on 3D QLC NAND, which is an indicator that the new type of flash memory is finally to the point in terms of production and reliability that companies like ADATA can offer it to their customers, albeit with only a two-year warranty. Notably, the drive is also among the first SATA-based QLC SSDs. 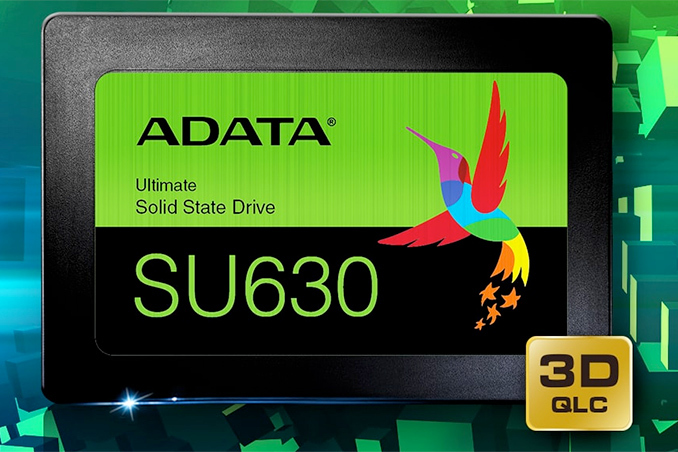 Aimed at entry-level PCs, ADATA’s Ultimate SU630 drives come in a 2.5-inch form-factor and feature 240 GB, 480 GB, and 960 GB configurations. The company says that the Ultimate SU630 SSDs support sequential read performance up to 520 MB/s as well as sequential write performance up to 450 MB/s when pseudo-SLC caching is enabled, based on numbers obtained using the ATTO benchmark. Interestingly, the 240 GB version is not slower than higher-capacity models. As for random performance numbers, the Ultimate SU630 is capable of up to 40,000 read and up to 65,000 write IOPS in case of the 480 GB and 960 GB SKUs. Moving on to the endurance of the ADATA Ultimate SU630 drives, the 240 GB version is rated for 50 TBW (TB Written), whereas the higher-capacity 480 GB and 960 GB models are rated for 100 and 200 TBW, respectively. To put this in perspective, these endurance ratings are one-third those of ADATA's entry-level 3D TLC NAND-based drives. This is not exactly surprising considering the peculiarities of QLC NAND memory in general. In fact, Crucial P1 SSDs are rated even lower, though the company a five-year warranty on its QLC drives. Meanwhile, ADATA ships its QLC-based drives with just a two-year warranty, which happens to be the minimum allowable warranty in Europe. ADATA does not disclose the controller it uses for the Ultimate SU630 SSDs, nor the supplier of 3D QLC memory being used. Keeping in mind how close the company works with Micron and Intel, it is more than likely ADATA is buying their QLC NAND made by one of these companies. As for the controller, so far we have only seen two SATA SSD controllers that are officially capable of handling QLC: Maxio Technology’s MAS0902A-B2C and Phison’s PS3111-S11T. Since Phison usually delivers turn-key SSD solutions with its controllers (i.e., fully assembled drives), ADATA has not been working with this company, which leaves Maxio as the most likely provider of QLC-supporting SATA SSD controller for ADATA. UPDATE 11/23: ADATA has confirmed Intel's QLC NAND and Maxio Technology's MAS0902A controller. Overall this is exactly the kind of drive we've come to expect from ADATA. The company has shown that it's not afraid of experimenting with new SSD controllers and NAND memory, and as a result they have dozens of products aimed at a variety of market segments, including niche ones. ADATA was the first independent maker of SSDs to offer drives based on 3D NAND several years ago. With its Ultimate SU630 the company comes up with multiple firsts: it is the first 3D QLC-based SSD from a well-known independent manufacturer, it is the first 3D QLC-based drive with a SATA interface, it is the first QLC SSD (likely) powered by Maxio’s MAS0902A controller from a popular brand. 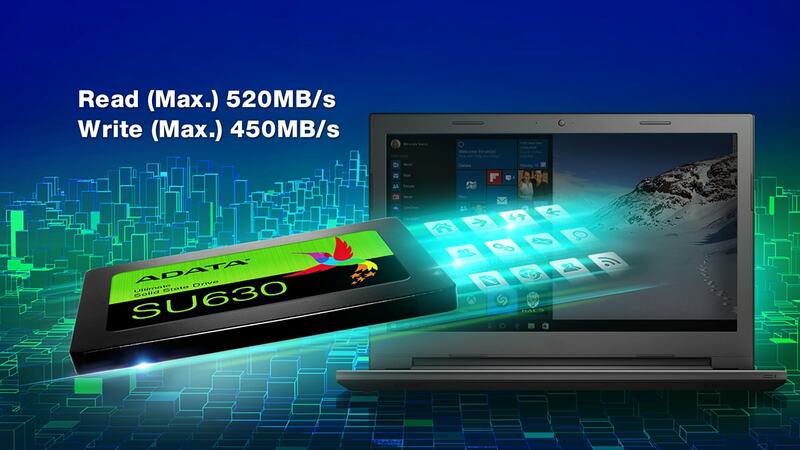 Meanwhile, ADATA makes no secret that the Ultimate SU630 is positioned as its cheapest SATA SSD: the drive formally sits below the Ultimate SU650/SU655, SU700, SU800, SU900, and XPG SX950U products, some of which are three years old. Time to talk about pricing of the Ultimate SU630. ADATA plans to sell the 240 GB model for $49.99, the 480 GB model for $79.99, and the 960 GB version for $139.99. Keeping in mind that street prices are usually below MSRPs, recommended prices of the new drives look competitive against other cheap SSDs. In the meantime, when acquiring such products one should keep in mind that their endurance is below that of many other inexpensive drives available today. QLC IS ABSOLUTELY WORTHLESS if they don't focus on delivering 4TB+ SSD for consumer storage for less than $700. For any other storage TLC is already as cheap and if you want to go deeper into the sink, dramless TLC. Using QLC for less capacity storage is just wrong.